Orthodox songs performed by the Sofia Priest Choir, Sofia Boy's Choir, Madrigal Sofia Chamber Choir, Sofia Orthodox Choir. Soloists: Nicola Ghiuselev. Priest Boncho Chakov, Nikolina Pankova, Priest Stanoi Andonov, Konstantin Mirinski, Dimiter Bonev. The tradition of church singing in Bulgaria is more than thousand years old. 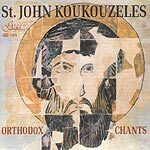 Two singing tradition exist in the Bulgarian East-Orthodox church (monodic) and choral (multiple voice parts), one of the prominent representatives of medieval chant writing is St. John Koukouzeles,(13th-14th c.) an angel voice singer and great reformer of East Orthodox church-singing tradition. 1 St.John Koukouzeles(13th-14th c.) "Hvalite gospoda s'nebes" 5'53"
2 St.John Koukouzeles(13th-14th c.) " Slava Ottsu" 1'35"
3 Anonymous author "Vozlyublyu tya ,Gospodi" 0'57"
4 Yoan H. Ohridsky "Dostoino est" 3'27"
5 Hieromonk Neophyte Rilski (1793-1881) "Voskreseniya den" 2'36"
6 Dobri Hristov (1875-1941) "Blazhen mouzh" 4'40"
7 "Vo Tsarstvii tvoem" 2'30"
10 Apostol Nikolaev-Stroumsky (1886-1971)"Blagoslovi dushe moya Gospoda i malka ektenia" 4'33"
13 Petar Dinev(1889-1980) "Blagoslovi dushe moya Gospoda" 2'17"